“My Nana gave me my first pet ever for my 6th birthday, a guinea pig named Harry. I’ve been hooked on the little, furry fuzzballs ever since,” says Natalie Truman of Manhattan, KS. Read Lily’s story in Natalie’s words. During her senior year in college, she moved into a pet-friendly apartment and knew she needed a guinea pig to make it seem like home. “Instead of looking at the local pet stores, I decided to begin my search on Petfinder,” she says. 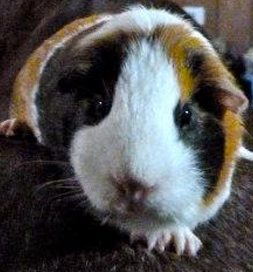 “Much to my surprise, there were quite a few guinea pigs up for adoption in the Manhattan area.” She found Lily listed by T. Russell Reitz Regional Animal Shelter. When Natalie says Lily is adventuresome, she means it. During winter break at Natalie’s home, the guinea pig perched atop Natalie’s horse for a photo-op and spent time “chasing the dog off his dog bed while running around in the kitchen,” under Natalie’s watchful eye, of course.